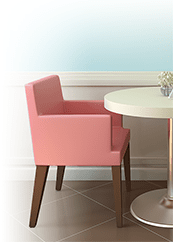 Restaurant Furniture 4 Less ships products from distribution centers, strategically located throughout the United States, to destinations all across the 48 contiguous states, Alaska, Hawaii and Canada. Many products are in stock and ship within 1 day. Some products are shipped directly from the manufacturer, which can require additional processing time. When your order ships, we'll send an email with a link to track your order. It may take up to 24 hours for your tracking information to become available to view. If you do not receive tracking information, please contact us to check the status of your order. Your order is securely packaged to arrive undamaged and complete. After your order ships, the transit company (FedEx, UPS or a freight carrier) is responsible for the safe and timely delivery of your products. For this reason, Restaurant Furniture 4 Less cannot guarantee delivery dates or times. IMPORTANT - Please read all the way to the end! Arrange to be present when the Freight Carrier delivers your order. If you cannot be there, recruit another adult (18 or older) who will handle your freight delivery for you. Freight shipments will NOT be left at your door without a customer signature. You will be responsible for getting your order off the truck (within 15 minutes) and inside your delivery location without any assistance from the delivery driver. If it is a large shipment (heavy and/or many items), plan to have enough people at the delivery location who can easily lift and carry your items. Have tools handy to open boxes or remove packaging materials and your camera/phone ready to take pictures. If you don’t have a loading dock, a forklift or sufficient staff/assistance available, you may need to purchase Additional Freight Delivery Services. The Freight Carrier’s driver will indicate which items are yours and present a Delivery Receipt or Bill of Lading for you to sign. CHECK FOR DAMAGES and SHORTAGES before you sign for the delivery! If you sign the Delivery Receipt, Bill of Lading or Electronic Signature Panel without making any notations, you are certifying there are no damages to the products (visible or concealed) and no missing products. You also forfeit your right to replacement products or a refund for product damages or shortages you may find after signing. So, please DO NOT SIGN anything until you inspect your order. Make sure that the box/case quantities listed on the delivery receipt match the actual number of products you receive. For example, if you ordered 10 products and they are packaged with 2 products per box, verify that there are 5 boxes in the shipment. Visible Damage is damage to the outside packaging and/or product that you can see before the packaging is opened. Examine the product packaging for tears, dents or holes. Concealed Damage is damage to the contents of a package you can’t see until the package is opened. Carefully open all boxes/cartons to inspect for concealed damage. Check for concealed damage right away – not longer than 48 hours after delivery. 1. Keep the damaged product(s) with carton(s) and packing material. 2. Call the freight company to report the concealed damage. 3. Request and schedule an inspection with the freight company. 4. Get a copy of the inspection report and keep it for your records. If there are no shortages or damages, then simply accept the shipment by signing the Delivery Receipt, Bill of Lading or Electronic Signature Panel. 1. If there are any missing products, write "Shortage". 2. If you find visible damage, write "Damage". 3. If you find concealed damage, write "Concealed Damage". Contact us at 1-855-307-3863 immediately after the driver leaves if there is a shortage or damage of any kind. Please have a copy of the delivery receipt with your notations for reference. If the driver won't allow you to inspect your order, and you want to accept the delivery, write "DENIED INSPECTION BY DRIVER" on the Delivery Receipt, Bill of Lading or Electronic Signature Panel and sign it. This is for your protection and to assist with documenting the freight carrier's accountability should a problem be discovered after delivery. If there are shortages or damages and the driver won't allow you to notate these on the delivery receipt or the electronic signature panel, refuse the shipment. Call our Customer Service Department at 1-855-307-3863. If you find that most of your order has been significantly damaged (for example, there is visible damage to most of the products), refuse the full shipment. If your order is delivered on multiple pallets and the products on one or more of the pallets are damaged, you can refuse those products and accept the rest of the delivery. We reserve the right to bill freight charges on shipments that are refused because they arrived later than expected, are forwarded to another address, or have been returned for lack of signature or incorrect delivery address. If a signature is required, CHECK FOR DAMAGES and SHORTAGES before you sign! If you fail to note damages or shortages, you may forfeit your right to replacement products or a refund. If Fed Ex or UPS leaves your shipment without obtaining a signature, open your package(s) immediately and verify there are no damages or shortages. Keep the damaged products(s) with carton(s) and packing material. Contact FedEx/UPS immediately to report the damage. Retain any claim or case numbers provided by FedEx/UPS. Contact Customer Service at 1-855-307-3863 and give the FedEx/UPS claim or case numbers to our Customer Service representative. Our Customer Service representative may request photos to assist with the resolution of your case. If we can solve the problem with replacement parts, we'll send the parts you need via FedEx, USPS or UPS at no charge to you.